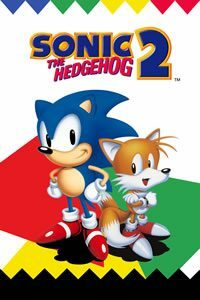 Late 2017, I looked for the enhanced version of Sonic 2 (for iOS and Android) that I read about a few years ago, and I was surprised that it’s now completely free from the App Store. So of course, I downloaded it onto my iPhone, with Sonic-speed! The app icon shows Sonic and Tails from the Japanese Mega Drive artwork, so it looks cool among the rest of the apps on our phone. Launching it starts a nice opening sequence, with screens of gameplay flying around over a white background, and music based on the classic series. The options menu looks great, with 3D icons for the different choices, including a 3D Japanese Mega Drive cart and a calm remix of Sonic’s classic music. We have options for save files (whether we want to continue a saved game, or start a new one, etc. ), and which classic character to play as, including Knuckles so we can play as Sonic with Tails following him, or we can play as one character alone: Sonic, Tails, or Knuckles. Tails has his added abilities from Sonic 3, so we can control his flight, and he can swim. 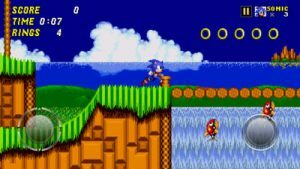 Sonic is the same as ever in Sonic 2, except he can join hands with Tails and fly around; even when playing alone, we can make Sonic and Tails do that (this ability to fly around, using the same single-player controls that we’re using to control Sonic, is an enhancement seen before in hacks; but it’s not actually part of the original series, outside one specific boss-fight in Sonic 3). Additionally, codes offer us the choice of playing as Knuckles with Tails following him, and we can choose to throw in the various shields from Sonic 3. The two-player versus mode is probably a blast, but I never got it to open up properly, on my iPhone. We have a couple options related to saving our score: “achievements” and “leaderboards” (neither of which would properly open up for me), plus there’s a time-attack mode. Additional options let us adjust the volume of music and sound effects. We can also change the region of Genesis or Mega Drive artwork, and we can adjust the touch-screen controls’ size and visibility. My first impressions of gameplay are that the onscreen controls work better than I had expected. Also, I was surprised that the graphics look the same as on Genesis, with the same 16-bit pixelation. I had expected the graphics to be more updated, but I still love the original graphics, and it all looks very smooth after being shrunken from TV-size down to phone-size. Compared to the 1992 Genesis cart, the big difference is that our view of the gameplay is much wider, to fit the shape of a smartphone screen, and also, to hold the controls in the bottom corners of the screen. We always see more of the stage all around us. I was mostly playing just to see the custom version of Hidden Palace Zone, so I was running through the stages quickly. My main impression of Emerald Hill was just how faithful this version is, despite the obvious changes. It looks and sounds just like the original, with extremely clear graphics and music. The special stages actually show the biggest improvement in graphics: Known for choppy animation on Genesis, the special stages now animate smoother than silk! It’s really a trip, after 25 years of choppiness, and using our imagination to pretend it looked smooth; now we can see how it really looks with actual smooth animation. Although the controls work better than I had expected, I don’t think that touch-screen controls can ever work as well as a gamepad, because a physical D-pad lets us feel exactly what we’re pressing, for Sonic’s movement. And the touchscreen can’t do that, so the control is never as precise. It works for the most part, so I can run and spin through loops and everything, but I might not be able to jump and land exactly where I want to. For example. My thumb often drifts too far one way or the other, over the digital D-pad. In effect, we end up playing Sonic 2 with slightly clumsy controls because it’s all touchscreen, with no way to feel the D-pad. The special stages’ controls are actually the most broken by using the screen as the D-pad. Every slight touch moves Sonic left or right, which is a problem when we can’t feel the D-pad, so we keep pressing wrong input, along with correct input. I’m always moving too far in the right direction, if not also moving in the wrong direction, every time I touch the screen. I do want to be fair in describing the controls, though. Beyond the fact of being on-screen, the controls feel just like on Genesis, and it’s probably as accurate as possible, mapped onto a screen like this. 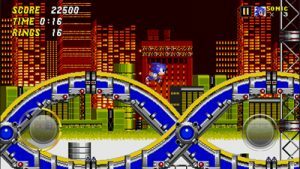 In Chemical Plant Zone, I was glad to see that Sonic can still run off-center of the screen, if he goes fast enough (I had been worried that this might be reduced, like in Sonic 3 & Knuckles). It definitely looks cool to out-run the camera in wide-screen perspective. The water’s surface is noticeably clear, lacking the flickering and graphical garbage that it’s known for on Genesis. Aquatic Ruin is especially better-looking in wide-screen view, as we see more jungle leaves, and more of that crazy background scrolling faster than our actual movement. Casino Night also looks great, with a wider view of the shimmering city lights, and the boss-fight is easier, because of the better visibility. Hill Top didn’t stand out as seeming very different in widescreen. Neither did Mystic Cave, except Act Two launches us into Hidden Palace Zone, in a pit that used to be a death-trap! The stage itself is fixed-up and added-to, as per the developers’ personal ideas, so it’s awesome, but it’s also a creative departure away from the scraps of Hidden Palace that we see in the prototypes. For instance, this is the only version of Hidden Palace with loops to run through, a zip-line to hang onto, and tubes that push Sonic out with a blast of water. And this is the only version in which the little T. rex-bots breathe fire. In addition to mechanical bats, T. rex, and triceratops (all from the Sonic 2 prototypes), there are a couple of new enemies: jellyfish-bots in the water, and a spiked-ball thing, which we will see again in the boss fight. And it is an all-new boss fight, but (with my apologies) I found it disappointing because I had seen screen shots the last few years, and I had imagined that there would be more to it! I had expected that the pipe organ in the background would be used somehow, but it doesn’t interact at all. The only connection is a vague musical theme, because Robotnik’s attack involves him blowing on a trombone, which triggers his attack. 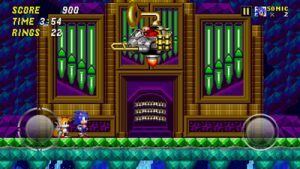 It works, but even the theme of music is weak because we hear the same boss music as ever, and the trombone only makes a few quiet notes that are barely heard over the boss theme. Oil Ocean seems about the same as ever, while Metropolis Zone mostly just stands out for those giant gears now animating smoothly as they spin. Sky Chase and Wing Fortress also seem about the same as ever, except that the touchscreen controls increase the difficulty of any precise jumping in Wing Fortress. Finally, Death Egg Zone is pretty much exactly how we’d imagine it would be with slightly clumsy controls, and a bit of smoother animation for Robotnik’s mech. The ending and credits seem unchanged. As a great touch, completing the game results in our save file opening up to a stage select screen, and it’s a version of the Genesis’ stage-select screen. Spinning above and beyond all expectations, Sonic 2 (2013) actually contains two more secret stages, in addition to Hidden Palace that I’ve already described! 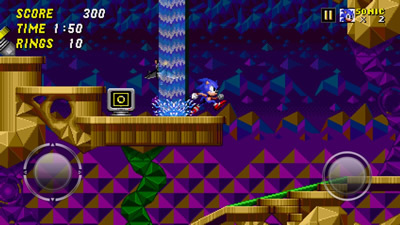 Accessible by cheat codes only, “Proto Palace Zone” represents the original layout of Hidden Palace, as seen in prototypes of Sonic 2, except it plays song 10, which is consistent with the final release, not the prototypes. Still, it makes sense as a mix of authentic elements; it’s the original stage structure, plus the music associated with the glitched stage in the final release. Dying in Proto Palace sends us to the revamped Hidden Palace that I described earlier, with fire-breathing T. rex-bots, and music from two-player Mystic Cave. Otherwise, surviving in Proto Palace and touching the giant Emerald will warp us back to the stage select screen (which is used to access Proto Palace). The other secret stage (accessible only by codes) is an eighth special stage, which is exciting because (as far as I know) the 16-bit special stages have never been hacked with new content, even though the rest of Sonic 2 has been changed extensively, in dozens of hacks. So, this is the first time that we are seeing new content for Sonic 2’s special stages. (And since this is a remake, it’s not actually emulating the Genesis game, whose special stages have still never been given new content, ever). Although the touchscreen controls will probably make us play worse than we do with a gamepad, this is still a great use of a smartphone, even if it’s just for a little while, to play Sonic 2 in widescreen, with controls that seem as accurate as possible. And if we want to go deeper into this title, we have the full classic game with enhancements, plus those three secret levels to check out! Also, we have surviving versions of the original built-in codes, for traditional stage select, Super Sonic, and debug mode. This is clearly a loving remake, by fans whose goal was to let us do anything that we could possibly want to. The free version of Sonic 2 (2013) comes burdened with frequent commercials, which is why it’s free. We basically get a commercial every time we do anything, like every time we beat a stage, so that’s a drag. Thankfully we can skip each ad after six seconds (or less), so at least we don’t get stuck for long. I find that the enjoyment of running through my favorite platformer, with slightly different and improved graphics, outweighs having to wait a few seconds between stages. But for those who can’t deal with repeating ads for Final Fantasy XV and Bingo Blitz, then the pay-version is for you, selling for $1.99. I would probably buy it if I had my debit card set up with the App Store, but even then, Sonic 2 on smartphone seems like a really cool gimmick, rather than a proper way to play Sonic 2, which still really deserves a full-size TV and a physical gamepad, no matter how cool and improved it is on iPhone. Sonic 2 (2013) is a great remake of one of the all-time best 2D platformers. It belongs on everyone’s iPhone, so spin-dash to the App Store and download it today!